How It Works / F.A.Q. There are many theories regarding this. 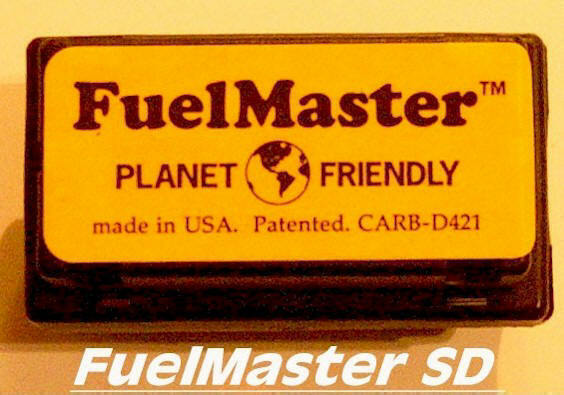 Yes, there is a patent on FuelMaster but even still we continue to research this phenomenon, to get closer and closer to a more definitive answer. We can go into a long dissertation here but we have chosen not to. We are available to answer questions if need be. We market results created by FuelMaster, we do not sell scientific explanation. There are many doubters. 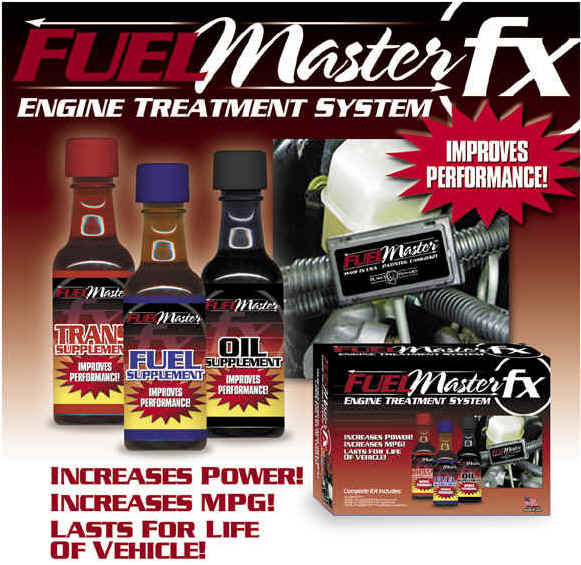 There are many who have bought the FuelMaster with a great deal of skepticism until they experienced positive results after using the product. If the product does not work for you, we provide satisfaction guarantees to support our product. We have been in this industry for more than 10 years and have more inroads towards the overall acceptance of this technology that many other companies in the business. How does FuelMaster benefit you? Independent, U.S. EPA Accepted Lab tests for FuelMaster show an average of 11.6% better highway fuel economy. FuelMaster owners have reported and average savings of 8% - 18%. The environment is something we all want to take care of so isn't it nice to know you can do your part by lowering your vehicles emission pollution & save money at the same time using FuelMaster products?? Approved by the California EPA/Air Resources Board (CARB) for installation on vehicles in the State of California. As a regulatory agency, CARB is responsible for enforcing the most stringent emissions standards in the country (specifically Executive Order # D-421). We are registered still current in 2010. 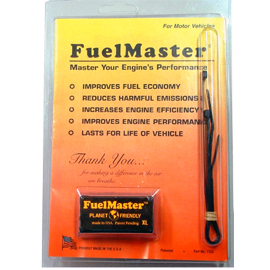 FuelMaster is arguably the most successful product of its type in the world. Our staff has been intensively involved in research and development of the science of magneto- hydrodynamics and its application to fossil fuel combustion since the mid 1980's. FuelMaster has mastered the dynamics of this technology by overcoming many variables which are unique to this specific usage. The FuelMaster has been tested by several agencies including an independent, recognized laboratory of the US EPA whose test resulted in an average of 11.6% savings in fuel economy in highway driving, accompanied by emission reductions listed below. What Results will I get? Results vary, both in real world and laboratory environments. Some FuelMaster Customers/Users have reported fuel savings between 8% and 18%, with better overall performance and smoother running engines. Some report lower (which means better) emissions on their vehicles. Results come in varying degrees depending on the individual's driving habits, road conditions and overall conditions of the person's engine and vehicle. Your results can, will and may vary. What is different between SD & XL? has the same size and similar appearance as the standard SD model; HOWEVER: The XL is a stronger unit which compensates for distracting variables that exist in engine components of some vehicles in today's world. The FuelMaster XL should be used for high performance; LPG and diesel powered Automobiles, SUV's, all Trucks, Buses and industrial equipment. Our FuelMaster XL Units are utilized in 18 Wheeler Big-Rigs, Heavy Industrial Delivery Trucks, and Tractor Trailer Haulers. Corporate fleets such as Xerox and a division of General Electric have started FuelMaster installations based on their intensive evaluation of the FuelMaster product. 1.) FuelMaster is a fuel economizer and pollution reduction device which utilizes magnetic hydrodynamic technology to improve the combustion of hydrocarbon fuels. Mostly, engine combustion is incomplete due to the molecular clusters of hydrocarbon fuel. In normal cases, only about 70% of the total burnt fuel provides the real power, with 30% of the fuel wasted and carbonized. 2.) The FuelMaster is the solution to this problem. When the fuel is passed through the fuel saver, the hydrocarbon molecules are temporarily ionized and create positively aligned molecules. The ionized hydrocarbon fuel results in a complete combustion when in contact with the negative oxygen (air-fuel mixture in the engine). 3.) The growing population of motor vehicles contributes to air pollution worldwide. Our field trials clearly indicate that the FuelMaster can help in reducing a good percentage of toxic emissions. Results obtained from FuelMaster May vary. With all of our years of experience in the field, we believe we have a very credible product. We are not going to "blue sky" un-obtainable claims, we are going to be honest and let you know that overall, our testing and more importantly our customers have indicated positive results obtained with the FuelMaster product installed in their vehicles. We want to hear from you regarding your experience with the product. We will be building a user forum on this site so that you, our end users can compare results with each other, let us know and let the world know of the vast potential of this product. 1. How long has this been around? : FuelMaster has been sold for a 15 year history in the World market. 2. Will the FuelMaster void my warranty---You do not modify the physical structure of your vehicle from its original assembly should have no effect on manufacturers warranty on your vehicle.